Congratulations to Lily Brodrick! Princess Lily Brodrick (left) and fellow candidate Erica Ewton pose after Rose Festival Court announcement. Follow these links to read more: http://www.oregonlive.com/rosefest/index.ssf/2015/03/2015_rose_festival_court_wilso.html. 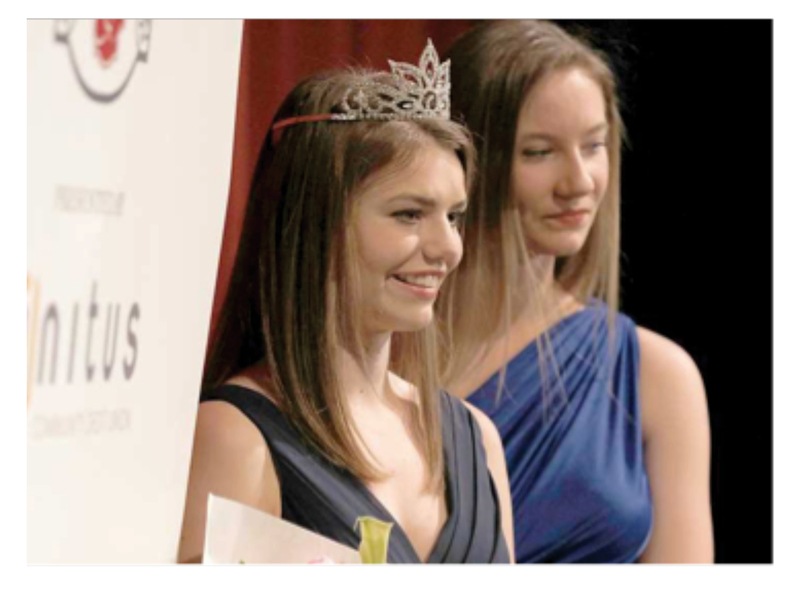 And http://portlandtribune.com/scc/103-news/253720-123495-wilson-high-school-crowns-lily-brodrick-its-2015-rose-festival-princess. Photo courtesy of PAMPLIN MEDIA GROUP PHOTO: JONATHAN HOUSE. Win a princess-cut, 1.08 carat diamond valued at $6200 to support the Wilson Foundation! Tickets are $100 and will be limited to 200 sold. (Certificate of appraisal will be included.) Thank you, Malka Diamonds and Jewelry, for the generous donation! All proceeds to benefit the Wilson Foundation, which raises money for additional teachers at Wilson: reducing class sizes, increasing course offerings, and enhancing every student's experience. Winner to be announced April 18, 2015. You do NOT need to be present to win. To purchase, please visit: http://www.pps.k12.or.us/schools/wilson/files/school-wilson/Rock_Raffle_Order_Form_final.pdf. Janice Johnson graduated in 1967, and she has just published Forty Wagging Tails and five other middle-grade novels as eBooks on Amazon. One of the stories (Complicity, Please) is set at a fictional Wilson High School. Last year she published a non-fiction account of her sailing adventure in Stumbling Aboard: A Reluctant First Mate Travels to 20 Countries, also as an eBook. The books are described on her website and blog: http://jjkay.net. Wilson High School alumna Angela Niederloh (class of ’95), mezzo-soprano, will play the role of Baba the Turk in the Portland Opera’s upcoming production of The Rake’s Progress (June 11, 12, and 14 in the Keller Auditorium). Portland Opera is presenting the Pacific Northwest premiere of The Rake’s Progress utilizing sets and costumes designed by David Hockney, one of the most popular visual artists of the 20th century. This visually stunning staging features the sublime music of Stravinsky's neo-classical period. A story about the choices we make, morality and good versus evil, The Rake's Progress has been produced to great acclaim for audiences around the world–Portland Opera is producing it as part of the company's 50th anniversary season.Angela Niederloh, mezzo-soprano, has been acclaimed by the New York Times as, "charismatic mezzo soprano." Angela Niederloh is a frequent Portland Opera guest artist, with roles including Dame Quickly in Falstaff, Dorabella in Così fan tutte, Angelina in Rossini’s Cinderella, Guinone in La Calisto, Melibea in The Voyage to Reims and Third Lady in The Magic Flute. She performed in Falstaff, The Magic Flute, and Jenufa as a member of the Houston Grand Opera Studio. Her additional credits include Così fan tutte for the San Francisco Opera Center and Amahl and the Night Visitors for Opera Omaha. Angela has performed in concert with the Metropolitan Opera Orchestra, San Francisco Opera Orchestra, Oregon Symphony, Boston Baroque Orchestra, New York Festival of Song, Aspen Festival Orchestra, and Portland Baroque Orchestra, and is a faculty member at Portland State University and Pacific University. Tickets to The Rake’s Progress will go on sale to the general public on March 23rd, but a presale is being extended to Wilson alumni, parents, students and staff beginning Monday, March 16th until March 22nd! To learn more, go to: portlandopera.org/production/the-rakes-progress/. Click on the “tickets” link to get to Ticketmaster and enter the password WILSON to purchase your presale tickets. 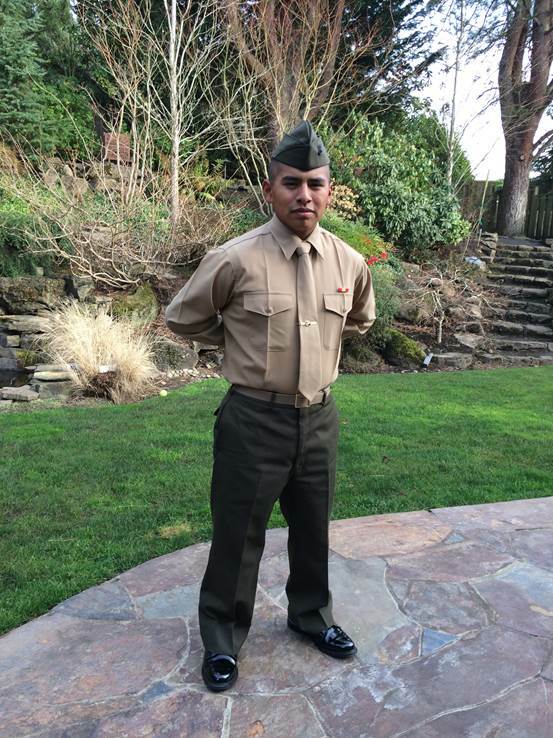 Cory Martinez '14 recently graduated from the U.S. Marine Corps boot camp on January 9, 2015. He is now a Marine in combat training at Camp Pendleton, California. He’ll go from there to Camp Lejeune, North Carolina for training as a Combat Engineer. He is in the Reserves program. Once his training is finished in Spring 2015, he’ll be stationed in Portland. He is planning to attend Portland Community College in the University transfer program. Cory is well remembered at Wilson. “As a peer counselor, Cory excelled at welcoming others,” states Kathryn Wolff, Wilson Counselor. “He was an easy person to talk with and did not hesitate to start a conversation with someone new. He also surprised everyone in class one day when we had a French foreign exchange student visit and Cory started a conversation with this student using fluent French! He was a well-liked and respected peer counselor.” Congratulations to Cory and his parents, Chris Martinez and Kevan Anderson. 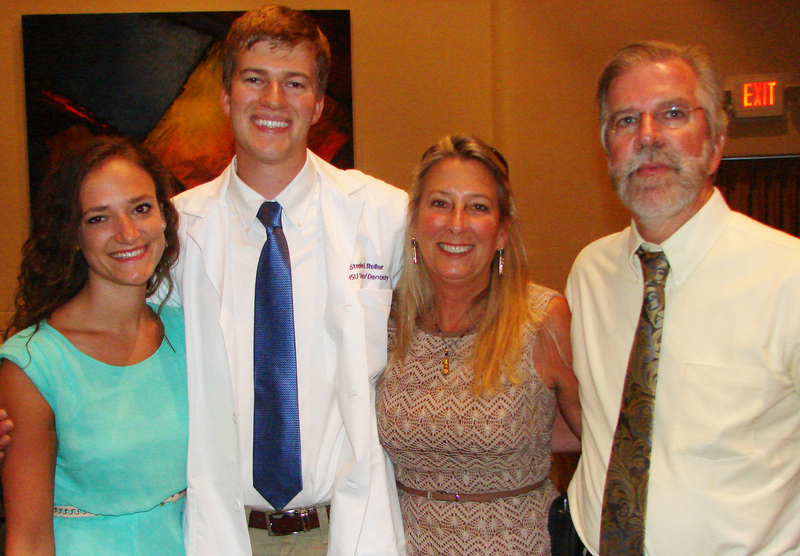 Since Keith Metz-Porozni ’02 graduated from Wilson, he received a B.S. in journalism at the University of Oregon in 2006. He has been pursuing a career in public relations. Currently, he works for R/West, an agency based in Portland with offices in San Francisco and New York. R/West specializes in regional and national advertising, creative design, interactive strategy and design, media planning and buying, social media and public relations. Keith and his wife moved to Central Oregon in March 2014, where he works remotely from Sisters, Oregon. Numerous Wilson teachers had an impact on Keith. Hal Jackson was his American History teacher and running coach. Keith says, "he always showed interest in all types of students and took as much pleasure in seeing a JV runner get a 'PR' as another who was contending for state.That shows a tremendous amount of character and I think about that often. Being a leader isn't just about the handful of the most talented, but about helping everyone you lead to realize their potential." Keith says Carolyn Wood had a tremendous influence on his writing. Adding, "She taught me how to construct an argument in a coherent and organized manner on paper. I wish she could have provided a few tips to my writing instructors at the University of Oregon! I still think about the nature journals we would write. The same could be said for Mrs. Clyman." He has always admired Kent Dorsey and Scott Aker. Keith says, "they were always willing to chat when I interviewed them for the Statesman and I had Kent for math and I made great strides in his class." Keith remembers that George Penk "made chemistry tolerable for me and dare I say enjoyable? I struggled with it and he was always very helpful." Keith also remembers Jeremy Shetler. "He was a campus monitor at the time and busted me a few times for coming back late from lunch but I've been so impressed with how he has emerged as a leader at Wilson, including becoming the head baseball coach." Suzanne Barrell (Bentson) lives in Queensland, Australia and is a member of the Class of 1965. She is a retired Librarian and has attended every class reunion and is looking forward to their 50th in 2015. As a child she attended Multnomah School from Kindergarten through Grade 8 and then up to half way through Junior year before leaving for Australia. Suzanne and her family moved to Australia (the country where her Mother was born - she was a WW2 War Bride. Her parents met in Brisbane when her Dad was stationed there with General MacArthur's GHQ) in March 1964. While in Australia Suzanne received her high school diploma from Wilson by completing coursework through the Oregon Board of Eucation. Later she attended the University of Oregon. We're planning to get together again in August at O'Connors in Multnomah Village. Hopefully, the huge success of our big 50th Reunion bash will translate into a super turnout in 2015 for our 51st. And if you're planning on attending, please don't forget to save your ID badge from last year for this year's (and future years') get-together. "Save the Date WWHS Class of 1965" for the 50th Reunion to be held on Friday, August 14, 2015 at the Tualatin Country Club. If you haven't received an email or a postcard from Reunions With Class, please go to their website - ask for your classmate code and register your contact information. Also, keep updated on our class Face Book page at Woodrow Wilson HS Class of '65 - PDX. Information will be posted as it becomes available. The reunion will be Saturday, July 25, 2015 at the Racquet Club 1853 SW Highland Rd. near the Portland Zoo. Please send your email to wilsonhs75@qwestoffice.net so we can keep you up to date with the details, including start time and the possibility of other events. And be sure to join our FB group at: https://www.facebook.com/Wilsonhs75pdx. We're having lots of fun sharing photos, and memories from the old days...and there'll be more information about the reunion posted there as we finalize things. Go to our Facebook page. Visit our Website. We have changed our reunion weekend to August 21 and August 22 this summer. Please check the "Wilson High Class of 95" Facebook group for more information. We have booked a venue for August 21 evening and will plan a park picnic for August 22 for families. CLASS OF 2005 ... 10th reunion plans?